I was buying some envelopes for the afore-mentioned Soar card at the Paper Source, and the woman at the counter asked about the card. When I said it was a linocut, she said she tried that herself, but never could “get it.” It is hard to get, in some ways. Really, when you can create the whole style of a woodcut or linocut digitally, without the sloppiness and randomness of hand-printing, why go through the trouble of creating a design, then cutting the design (sometimes multiple versions, if you are doing multi-colored prints) and the aggravation of prints that don’t pull quite as well as you’d like? For me, a lart part of the appeal is the process. I work in IT, so I don’t relish the idea of coming home to spend more time on the computer. I like working analog, with physical objects. The tackiness of the ink when it’s rolled out onto the block, moving the barren over the paper, the unpredictability of the outcome. The low-tech approach of hand-made prints is relaxing in its own way. The level of planning and flexibility that’s required helps keep the focus, because while I can adjust to or correct mistakes, I can’t completely undo them in the real world. Given the boom of the craft and handmade movement, it seems like I’m not alone in this. The thing is, I appreciate digital work as well. But I’ve never been an “out with the old” type, I just add more tools and skills to the pile. That’s another part of the appeal for me, and I suspect for others, in learning old technologies and processes. It’s a rejection of the mentality that everything new necessarily has to replace something else. That’s an idea that I think has cut us off from a lot of great works, especially once some authority declares a movement or a medium dead when it hasn’t even been fully explored. Ultimately, we all need a chance to slow down and enjoy the work we and others do for its own sake, and stop worrying about being cutting edge. A couple of weeks ago I took a staycation that was supposed to be a chance to catch up on some projects I’ve felt like I was falling behind on. Of course, that’s when I got the flu. Not the swine flu, but just the plain old I don’t have the energy to do anything flu. So, it was a minor miracle that I got some things done. I got some under-sketches for a series of drawings that I intend to turn into a book, tentatively titled “13 Devils and 13 Demons”. I also made this block print of a flying squirrel, which started as sort of an upbeat greeting card for a friend (normally, I don’t do upbeat) and wound up being something I was pretty satisfied with. The card was two colors, easy enough to do just by inking up the top with brown and then the bottom with green. That’s my favorite kind of dual color print, no need to worry about registration or cutting multiple blocks. I also did a few single-color prints with some Speedball paper I had. The print and card are available through my Etsy store. I’m a sucker for books about printmaking, even though, realistically, I’ve only been practicing a very basic form of hand-pulled relief prints. So naturally, I have to recommend The Printmaking Bible, by Ann d’Arcy Hughes and Hebe Vernon-Morris. Yes, it’s got a hefty cover price, but it’s worth taking a look at if you can find it at your local library, or if you have the means to buy. I love reading about the process of all types of printing, from lithography to intaglio and relief printing, and I love seeing the results. This gives you both, and from a contemporary fine-art point of view rather than a “look at the pretty curtains I printed” crafty attitude that’s all too common with how-to books and web postings. Now if only someone would write a book for self-imposed outside artists, I’m golden. The one problem with flipping through The Printmaking Bible was that I wanted to take printmaking classes that I don’t have time for and buy equipment that I can’t quite afford. In case anyone’s been keeping track, I’m still only on number four of the mixed animal series. That’s pretty far short of my original goal, but I’m sure as hell not counting. I’ve got a few more definite, must-draw beasties, and then I think I’ll call it quits and look for a show to hitch these things to. I can’t wait to get to my next idea, something more appropriate: 13 devils and 13 demons. Here’s the final centipede print, including a few little pill-bugs (another block I cut just in time for this project). 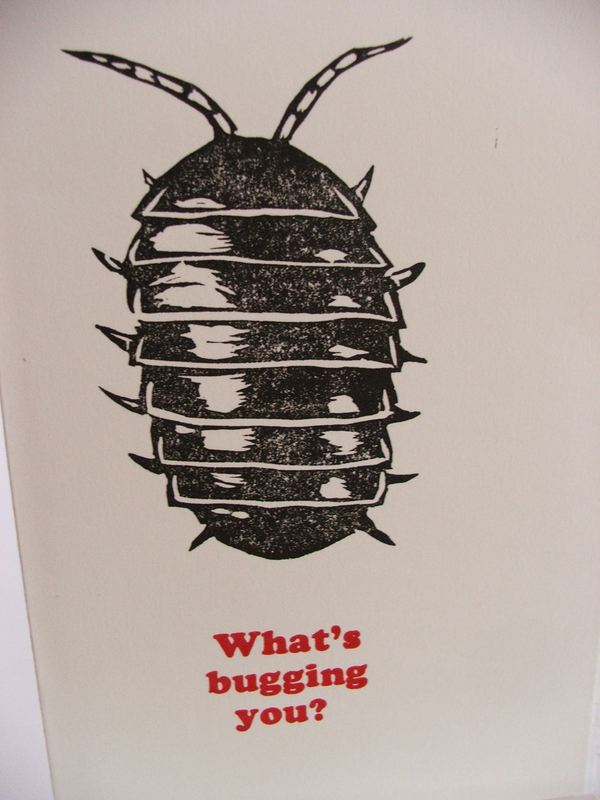 The pill bug will probably get its own dedicated print, because I like it so much. This was the quickest shot I could get, but a better one will be taken soon. I’m going to be doing a number of things with the centipede blocks, including having the segments printed on separate panels strung together. Creating seven separate blocks gave me a lot of flexibility for creativity. It’s giving me some other ideas for future projects. I’ve been working on and off on this seven-block centipede print for the past year. This is basically what happens with block prints: I get an idea, and it seems really good, but I never really factor in the amount of work that is involved nor the nature of the medium I inevitably choose to work with. Then I slowly work on cutting a number of linoleum blocks and think about how to create the final print. In this instance, I discovered that I couldn’t find a long-enough sheet of printing paper, and had to force a few curves into the print, also leaving an annoying empty spot in the center, that tomorrow I’ll be filling in with a couple quick pill-bug prints. But the process was fun to do. I don’t have access to a press, and with a project this large it’s probably not practical anyway, so each print is done with seven blocks arranged and printed one by one, in a painstaking process. Old Scratch has been exiled to the living room. It’s Ladies Night, and that leaves me just a few precious minutes at a time to duck into the kitchen, lest I hear something I truly didn’t care to hear. A while back I posted about a large block-print I made, which I did with two colors: silver and black. It wasn’t quite the way I wanted, because I failed to plan and had already cut into the center of the subject, which would have been the full silver color, before I realized I wanted to use the reduction method to do multiple colors on this print. So, now, with the first block all cut up, I broke down and got a second, printed the tree from the first onto paper, and then did a monoprint onto the other block. I’m now cutting only the outline, and with some finagling in registration, I should be able to have a nice set of full two-color prints. I was just talking to someone about my prints tonight. I explained that for some reason, I’m always drawn to linocuts, even though time after time I swear I’m done with this medium. It’s immensely satisfying, and oddly relaxing, with the combination of physical effort and mental concentration lest you slip and gouge yourself, or wreck your image. Yes, the same thing can be done digitally, but after working all day on computers, I don’t relish the idea of doing it some more when I get home. It’s one of the reasons I no longer write as much as I used to. You are currently browsing the archives for the Block Prints category.